Congratulations to "Colleen", the winner in Donnell's giveaway. Thank you to all who participated. I’ve been a volunteer victim advocate, and some of the things I’ve learned in that job are life and death, and confidentiality is huge in this position. Break a confidence here, and someone might get seriously hurt or worse. I know how important it is to keep secrets. Now if someone tells me a secret that puts him or another at risk, that’s a different story. I have to weigh keeping silent when someone might pose a risk to himself or another. As a matter of fact, in that case, it’s your duty to report it to the appropriate authorities. So, recognizing that I’m never going to make it on the gossip circuit, I turn to fiction. Chances are, too, that my characters are going to have secrets. Big ones, that if known could destroy lives. In BURIED AGENDAS, my heroine Diana Reid has a secret. It’s something so damaging she’s become reclusive in her personal life, given up the man she loved, and stayed away from her hometown for eight years. Now that’s a secret . . . .
A devastating secret drove her from her lover’s arms. Will a secret equally as deadly lead her back to him? Diana Reid is an investigative reporter skilled at uncovering other people’s secrets. It’s her own that she works to keep buried. Eight years earlier, she promised to leave her fiancé and hometown of Diamond, Texas forever. That pledge vanishes, however, when she receives a letter stating people are going to die, implicating her hometown’s largest employer, and making a veiled threat against her mother. With no other choice, Diana will return to Diamond, albeit in disguise, to discover the anonymous author. Brad Jordan moved on with his life after Diana walked out on him. Needless to say, she’s an unwelcome topic where he’s concerned. Leaving his brother in charge of Jordan Industries, the family business, Brad pursued a law degree and is now mayor of Diamond. Just as he rebuilt his life, he plans to rebuild his struggling hometown. Those plans are threatened when an El Paso physician notifies Brad that she believes Jordan Industries is conducting illegal practices and sacrificing the public’s health. When the doctor suggests bringing in Diana to uncover the wrongdoing, Brad opposes the idea. Diana is the last person Brad wants to see personally or professionally. Still, when she appears in Diamond in spite of his wishes, Brad is forced to accept that a woman he vowed to forget may be his only option to get to the truth. Together Diana Reid and Brad Jordan face a dangerous adversary—one whose only intent is keeping a deadly agenda buried. Naturally, Diana’s secret is revealed and her world is shattered. But I write romantic suspense, and I promise if you stay with the story, you won’t be disappointed at what happens in the end. So, what about you, have you ever asked someone to keep a secret? Did they keep it? Do you keep secrets? Find them hard to contain? I’m entering commenters today into a drawing in which I’m giving away two prizes. A copy of Buried Agendas, and a DAMMIT doll! 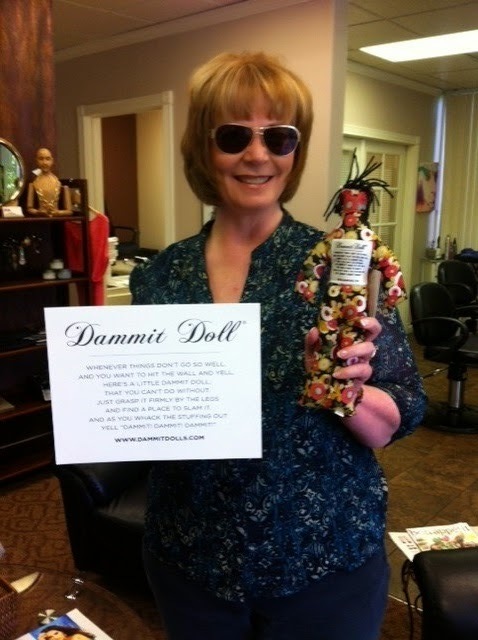 A DAMMIT doll you ask? Absolutely. For those of you who have secrets and you’re bursting to share, perhaps a DAMMIT doll will help you keep it. And for those who have no trouble keeping secrets, you’ll have this little beauty for those (hopefully) infrequent bad days. 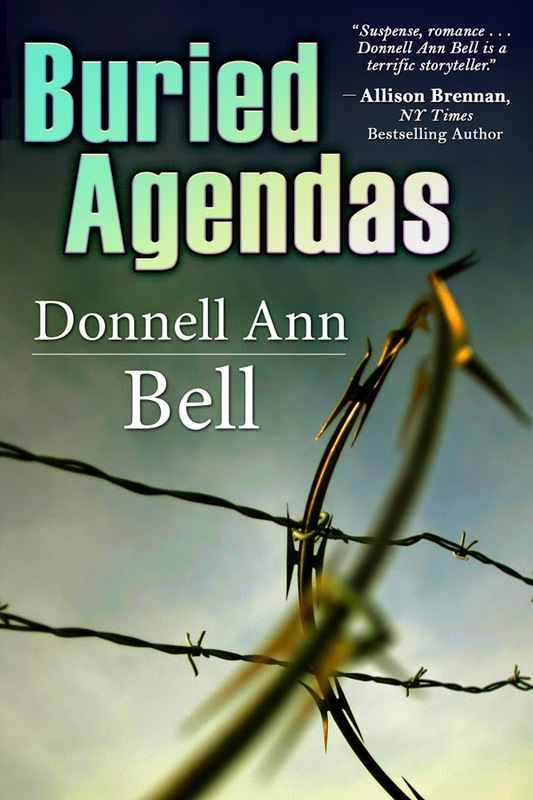 If you read Buried Agendas, or any of my other books, I hope you’ll share with me your thoughts. Contact me via my website www.donnellannbell.com or come like my author page on Facebook. To secrets. Authors love to tell them. Donnell Ann Bell is an award-winning author of three romantic suspense novels, all of which have been e-book bestsellers. Buried Agendas is her fourth published novel. Currently she is working on her first suspense series for Bell Bridge Books. Donnell and her husband live in Colorado. Giveaway ends 11:59pm EST November 5th. Please supply your email in the post. You may use spaces or full text for security. (ex. jsmith at gmail dot com) If you do not wish to supply your email, or have trouble posting, please email maureen@justromanticsuspense.com with a subject title of JRS GIVEAWAY to be entered in the current giveaway. Sue P. thanks for the compliment. I hope it is intriguing and I'll save all my secrets for books; how's that? I love your books! Keep them coming. As for me sharing another persons secrets, it just won't happen. Personal trust means a lot to me. I believe you have to respect other peoples wishes. Best wishes and many sales! Jerrie Alexander, I knew that about you from just a few conversations. Trust is such an important issue. You rock. Thank you! Secrets I can keep... I would never feel right blurting something out... Truly enjoy your books! Thanks for sharing! Thank you, Colleen C. for the wonderful compliment. I'm glad you and I share similar feelings. Hi, Annette Briggs: I hope it engages the readers. I sure had a lot of fun writing it. I hope you enjoy! I am very good at keeping secrets. Not my business to pass it on. Mary Preston, that's the way I look at it. Wise woman! Yes, secrets! Everybody has them. And, they are always interesting to have in a book. Janet Kerr, glad you feel that way. That's where I tell my secrets also. The only reason I would reveal a secret is if it put someone in danger. Taurus, exactly. Thanks for commenting and stopping by! jbiggar, we never mentioned giving advice, did we? That's a whole different blog topic :) Great to see you here. Thanks!